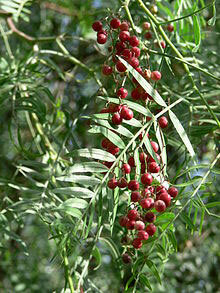 Schinus Molle, Peruvian Pepper, also known as American pepper, Peruvian pepper tree, escobilla, peppercorn tree, Californian pepper tree, and Peruvian mastic. is an evergreen tree is native to the Peruvian Andes. This large tree is ideal as a specimen or shade tree in a large garden or farm. The trunk and branches seem to look older than they are giving the tree structure early in it's life. Chains of cream flowers in Summer followed by Peppercorns, which turn pink in Autumn. By Winter they are ready for picking and drying for use in cooking. 30cm high plants available at the moment.